It happens every year. By the end of July, my zucchini plants have bit the dust. I know of some gardeners who do not like to grow zucchini because they find themselves overwhelmed by the plant’s productivity. But that is not a problem I face because of two little “friends” who call my garden home – Erwinia tracheiphila (a bacterium) and the cucumber beetle. Knowing the biology and pathology of what is happening does help to explain the problem and make sense of it, but I miss my zucchini. Over the years I have tried all kinds of things: different mulches, pesticides (in my pre-organic days), garlic spray, floating row covers and interplanting the squash with onions. Nothing has really worked. One web site recommends commercial growers with a wilt problem to not growing cucurbits (squash, pumpkins, cucumbers and melons) for six years to break the insect/disease cycle! That probably would be the best thing to do. I have learned that once my zucchini die, the cucumbers will soon be doing the same. And I cannot grow winter squash at all because the fruit does not mature before the wilt takes over. But I am not sure that I am ready to give up on zucchini. I think there are some other options. I could just accept the fact that zucchini is a short-lived vegetable in my garden and plant a new hill every few weeks until mid-July, knowing that as one planting dies, a new one will be coming into maturity. I have read about the organic use of kaolin clay (Surround WP) as a foliar spray that renders the plants unrecognizable to cucumber beetles. That sounds interesting. Another idea is to try growing some zucchini in a large pot or whiskey barrel far away from the vegetable garden. If I use artificial soil there will not be any beetle larvae or eggs in it and it will probably take some time for the cucumber beetles in the garden to find this lone, isolated plant. I have grown zucchini in a barrel before and it grew very well. Dealing with problems like this can be frustrating but it is part of what I love about gardening. Sure it would be nice if everything grew perfectly with no insects or diseases but I know that is unlikely to happen. Instead of cursing the insects and diseases, I can face these setbacks and enjoy learning the biology of them. I can experiment with new tricks and techniques to control and/or manage the problem. If I cannot control the disease or insect, I can learn to live with it and work around it. And if nothing works, there are a lot of farmer’s markets around that will gladly sell me zucchini from their fields that do not have an E. tracheiphila infected cucumber beetle problem! So, rest in peace zucchini. You fought the good fight and produced a number of fruit for my enjoyment. I now have ten months to think about how I can keep you alive next year. After all, I think that is the gardener’s motto – next year...! Michael C. Podlesny is the owner and a contributing writer for Mike the Gardener Enterprises, LLC the exclusive home for the Seeds of the Month Club. your empty bag of sun chips. being healthy for the environment. "why haven't these bags been developed earlier?" It isn’t as if most people have old tractor tires just lying around collecting dust. Nevertheless, a good old tire that’s no good for driving on anymore doesn’t have to go to the trash pile. And when it comes to raised beds, there’s hardly a thing better than a burly tractor tire. By making a few minor alterations, removing the upper rim and painting the outside, that old hunk of rubber can have a second life—maybe even one that is nobler than the first. To the gardener, it would be an insult to explain the benefits of raised beds. Just the same, they would be remiss to overlook the cost of materials to build raised beds. Purchasing good wood for frames is expensive, but it can’t be cut out, that will only lead to board rot and an open invitation to soil pests. 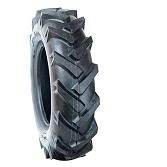 Intro the tractor tire. He had a hard life on the wheels of his green driving machine and is excited to a retirement of laying about doing a whole lot of nothing. Instead of making a costly purchase like railroad ties or treated wood, anyone who is interested can meander down to a local auto shop, poke their nose in and inquire about used tires that are destined for the dump. Most mechanics are happy to unload useless tires since it saves them a trip to the dump and any of the associated paperwork that accompanies rubber waste. What that means for the gardener is that he or she can acquire a perfectly good raised bed for free. Then, once the tire has been introduced to its new home, it is just moments away from becoming a part of the thriving garden. The trickiest part of the tire to raised bed metamorphosis is cutting away that husky upper lip. Often the rubber will be about three-quarters of an inch thick along the outer rim. That’s a job no scissors could address, but a handsaw would gladly step in. After the rim is cut, the tire is nearly ready. Because the color black is such a great heat conductor, the tire will need to be painted a lighter shade: white or yellow will reduce the amount of heat absorption keeping plant roots from burning and water from increased evaporation. After a coat of spray paint the tire will be ready to fill and plant. While one tire won’t be able to accommodate a large crop, it will open up a few advantages that traditional raised beds are not good for. One tire could be unobtrusively placed at each directional plane of any house, meaning that varying degrees of light would shine on each one throughout the day. Since plants have so many different needs for direct sunlight, this is a great way to open up more possibilities for the plants that can be grown. By freeing the tractor tire from the doom of a landfill, any garden can thrive and become more versatile. Composting can seem like a daunting task; the price of a specialized composting bin alone can deter even the most fervent gardener. And once you start considering the benefits of compost you start to wonder if that $80 bin from your local hardware store might just be worth the investment. Luckily, there are a few easy ways to kick start your compost, reduce your household waste, and save money at the same time. Compost is an amazing thing. Not only is it packed with micro- and macro-organisms that give your garden a boost like no synthetic fertilizer possibly can but it is the best time-release fertilizer there is; often taking anywhere from months to years to completely deplete the nutrients in it. Compost can also help to balance any pH problems you might have by neutralizing either acid or alkaline soil while improving your soil texture. The organic material can help sandy soil retain water or give clay or silt filled soil a chance to properly breathe and drain. Whatever your garden needs, it is likely that compost can provide it. To begin your compost pile, as quickly and inexpensively as possible, visit your local hardware store and purchase a small tarp (whatever size you anticipate you will need to hold your kitchen waste). When you get home cut a few holes for drainage in the tarp and lay it wherever you have room. Next, find a starter you like and then begin piling scraps from your kitchen on the tarp. You don’t have to buy expensive compost starters from the store. Manure, soil, or some compost from a friend’s pile will work just as well. Use one or all three of those materials to get some of those essential decomposing organisms mixed into your compost. As you begin collecting your scraps your first concern may be not knowing exactly what to keep. A good rule of thumb is to exclude fats and proteins. This means to leftover meat scraps, bones, lard, oil, and so on. It’s not that those items won’t compost, they simply will attract unwanted critters and are very difficult to compost. Some of the best ingredients you can include in your compost are egg shells, coffee grinds, the moldy end of the bread loaf and newspaper. Yes, newspaper. Tearing the paper into small shreds and adding a small amount can help regulate the moisture in your compost while helping keep the nitrogen-carbon balance that is so important in composting balanced. Once you know what’s important to add and important to keep out, go ahead and throw all your waste in there; don’t forget the used tea bags, melon rinds, and the moldy end of that loaf of bread. Some of us are a bit image conscious about where to keep your scraps. You don’t want to send them piecemeal out to your compost pile but you don’t want a bucket of old food sitting on your counter. Cookie jars or canister sets can make a lovely counter-top option, but be sure to dump the air-tight jars frequently; the anaerobic environment can cause your scraps to give off an awful odor. If you’d like to keep your compost next to the door between your kitchen and patio go ahead and keep it in bags or old milk cartons that are set inside a wicker basket or old wooden milk crate. I’ve even heard of people filling umbrella stands with scraps. Now that you’ve lain your tarp, piled scraps on top of it, and waited three or four weeks it’s time for your first turning. Some people will leave the pile for a few months and then pull the tarp out from under it turning the bottom of the pile to the top for the first turning. Some people like to remove the top two-thirds of the pile and then pull out the tarp so you can begin using the finished product from the bottom layer immediately. Whatever you choose to do remember that “almost” is perfectly acceptable when you’re talking about composting. Not everyone has the patience to wait until your compost is a fine, smooth, ready to sieve mixture. If there are still come melon rind scraps, twigs, or other slower composting materials but pull them out and save them for your next pile. The organisms in the pieces you pull out will give your next compost pile a good head start. If buying tarp and waiting anywhere from a few weeks to a few months sounds like a whole lot of work, trench composting might just be the choice for you. Dig a four to six inch wide eight inch deep trench along your garden row. Invest in some chicken wire and pull it over the top as you fill your trench over time. The chicken wire will keep any curious animals out of your trench and will help mark your place so you don’t forget where you last buried your scraps. As the scraps decompose it will release nutrients into the surrounding soil, giving your current garden a boost. Then next season you can plant your garden on top of the trench you dug, and then buried, and you’ll have beautiful compost infused soil that will provide your garden with the healthy soil it needs all season long. There are numerous creative ways to compost. 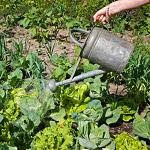 Ask your local Master Gardener or maybe just the enthusiast next door for tips on what has worked best in their garden. As long as you’ve got the basic formula, air flow, food and lawn scraps and patience, you will be good to go! Emily Hall is a contributing writer for Mike the Gardener Enterprises, LLC the exclusive home for the Seeds of the Month Club. I stopped to grab some gladiolas from my old friend Herman’s roadside stand. It’s the thought that counts, and three stalks for $5 was a great bargain for a happy wife. There, on the table next to the stand rested fresh garlic. I had never seen such beautiful garlic. Not the shriveled, white dried out stuff from the grocery story but pungent, purplish bulbs almost the size of a billiard balls, with stalks still attached. My favorite vegetable in more glory than I had ever seen. Suddenly, I heard a buzzer ring. “I’ll be right there, ma” Herman said as he rose from the old couch on his front porch to head inside. On my last visit, he’d told me it was OK to wander around his half-acre garden. “You might learn something” Herman had said. He was 85, walked with a spade for a cane and lived to care for his garden and his loving wife who was immobilized by physical ailments and lost in a sea of dementia. I wrapped the flower stalks in paper towels, knotted a shopping bag around the base and tossed them on the front seat of my truck with the garlic and headed home. Herman was nowhere to be found. Two days later, as I headed to the North Tonawanda City Market, I stopped again. Looking across the garden I spied Herman leaning on his trusty shovel. I wandered toward him. He eyed me suspiciously. A smile came to his face. “It’s because I know how to grow it. “You need to start with good seed stock – something grown around here is best. Mine is rocambole. They call the good kinds for the north ‘hard neck’. Plant it late in the summer or early in the fall. When it throws up a flower stalk in May or June, pick it off. Some people think its better eating the stalks than the bulb. “What else do I need to do,” I asked. “What about fertilizer?” I asked. That was it. An hour later, I’d pulled oodles of creeping charlie from his tomatoes and was on my way with a quart of individual cloves. I’ve been successfully growing garlic from that stock ever since. The important thing in our zone five climate is to be certain to start with good seed stock – the dried out mass-produced garlic from the grocery store gives poor results, at least in Western New York. And those seed heads – they call them “scapes” have become a favorite treat when in season. They even sell them at the farm market in town now. Joe Genco is a struggling gardener and recovering journalist who works as a financial advisor in Clarence, NY and a contributing writer for Mike the Gardener Enterprises, LLC the exclusive home for the Seeds of the Month Club. There is an aged old saying that reads, “when life gives you lemons, you make lemonade.” Meaning to me that if you are dealt a bad situation, you and only you can make it better. Makes sense right? Home vegetable gardening is not all that different. It has its ups and downs. Some plants do better, some need work and then there are those pesky weeds. But did you know that you can make vegetable gardening life a lot easier on yourself with help from your household garbage? Everyone wants their trash to just go away, and everyone has the power to make that happen, for the most part anyway. I will get to more on that in a moment. The bulk of the trash that you and your family produce weekly can actually be used for your home vegetable garden in the form of compost. 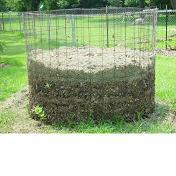 Compost is the result of organic material breaking with the end result being called humus. The humus then can be mixed in with your soil where you grow your vegetables creating a more nutrient rich and friable base for your plants. So what, in your arsenal of trash, qualifies to be composted? Anything organic basically. All of your food leftovers (with the exception of meat and chicken bones), coffee grinds, the filter, tea bags, newspaper, junk mail, cardboard boxes, your grass and bush clippings, leaves, twigs, livestock manure and the list goes on and on. Items that you should avoid composting…plastics, glass, aluminum cans and foil, pet and human waste. We don’t want to turn your yard into the township dump site. There are a number of ways you can compost. Which one you choose will depend on how much room you have and what fits your lifestyle. Here is what I do. 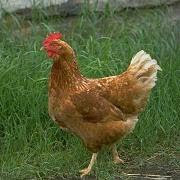 For all of my food scraps, I dig a hole in my garden about 24 inches deep and bury the food scraps. I then cover with the dirt and let the ecosystem do the rest. Bacteria and other microbes as well as worms will take care of it and in turn leave me great compost for my plants to use. I do this because rotting food can attract undesirables such as rodents and pests. So burying it deep enough helps eliminate this problem. For the remaining items, I mix them right into the soil with a garden tiller and yard shredder. The items break down faster. Some people keep a compost pile and then when the material is done breaking down, then they add it to the soil. Both ways works fine, which one you choose is up to you. The important thing to remember here is that you can take most of your household trash and use it towards building better soil for your plants which will give you better tasting veggies. I first encountered Herman when I stopped to ask him about his garden in North Tonawanda, N.Y. I was working as a newspaper reporter and saw his bountiful half-acre patch as incredible. A few times I had stopped and purchased gladiolas or sunflowers for my wife from his roadside table, with the “honor can” screwed down tightly. I looked across his patch. It was just before 5 p.m. on a Wednesday “You have the nicest garden in the city and I want to do a story about it for the newspaper,” I told him. “There’s nothing special about my garden but I guess I could show you around,” he said. Chickens clucked in the background. Garlic. Glads. Strawberries. Not a weed anywhere. Tomatoes. On the far end of the garden piled three feet high were stacks of leaves. A network of paths divided connected all his different patches. He pulled me a radish the size of a baseball. It was the first of many visits. I asked him about his soil and his rototiller. “I don’t have anything but this shovel,” he said. He used the spade half as a cane, leaning on it as he walked. “As for the soil, the secret is your newspaper, chicken poop and sawdust, in layers. I lay down new paths every year and turn the old paths under. Mixing in some of those leaves from over there. “When I started, this land was all swampy. I’ve built it up with leaves and such.” I headed for home with my radish and my lessons from Herman. Be good to your soil. Organic matter is everything. Newspapers. Sawdust. Chicken crap. A $10 shovel and patience are all you need. And he might have been politically incorrect, but the folks at the renaissance Club really did love his radishes. Joe Genco,a struggling gardener and recovering journalist who works as a financial advisor in Clarence, NY, is also a contributing writer for Mike the Gardener Enterprises, LLC the exclusive home for the Seeds of the Month Club. Joe can be reached at joegenco@gmail.com. The first days of summer have arrived and I am thinking about the cool weather of fall. It is not that I dislike summer. I love it. But as a gardener who likes to make the most of every square foot of land that I am cultivating and who loves fall crops, I know that I need to plan for a bountiful fall harvest and the planning starts now. My tomatoes, peppers, eggplant and zucchini are just starting to produce and will continue to do so (insects, disease and weather willing!) until frost. But when I look at the bed of onions and garlic, I know that within a month, they will have been harvested. The same is true for the bush beans that have started to produce. The beets, carrots, spring broccoli and chard will soon be gone as well. There is going to be a lot of open soil waiting for something to be planted. Now is the time to be thinking about how this space can be used and what can be planted. A number of vegetables do well in the cool fall weather. The list of these plants include: beets, broccoli, cabbage, carrots, cauliflower, Chinese cabbage, collards, endive, kale, kohlrabi, lettuce, radishes, rutabagas, spinach, Swiss chard and turnips. Some, like kale and collards, taste better after they have been touched by a frost. The choice of what you grow is up to you. But the trick with fall planting is making sure that the plants have time to mature before frost. To determine when to plant for a fall harvest, you need to know the average date of the first frost in your area. You can find your first frost date through a search online or by giving a call to your local cooperative extension office. Once you have the date of the first frost in your location, pull out a calendar and start your calculations! Here is an example. Let us say that the average first frost in your area is 10/15. Since the amount of daylight and the intensity of the sun decrease in the fall, plants can take a little longer to grow. Therefore it is recommended that you add two weeks to the growing time of the plant to make up for this seasonal change. So, with a first frost date of 10/15, we move back two weeks and have the date of 10/1. Now it is time to use the days to maturity found on seed packets. If you are planting Cherry Belle radishes which take 22 days to mature, you will want to plant no later than the first week of September. Shogoin turnips mature in 45 days so mid-August would be the latest time to plant them. Royal Chatenay carrots take 70 days to mature so these should be planted by the end of July. Bright Lights chard matures in 50-65 days so early August would be the time to sow these seeds. You can easily calculate the latest that you can plant any fall crop using this technique. One thing to note is that if you are planning to grow broccoli, cabbage or cauliflower, the days to maturity listed on the seed packet are a little deceptive. With these vegetables, maturity is calculated from the time that you transplant a 4-6 week old plant. So if the cabbage you are growing takes 60 days to mature, using the example, you will want to set the transplants at the end of July and you will need to sow the seeds mid to late June. Or, you can just wait to see when cabbage plants are available at your local garden center – they tend to arrive at the right planting time for your location! The Montana State University Extension has a wonderful self-learning resource entitled “Can I Grow That Here?” by Amy P. K. Grandpre. It will help you calculate planting times for spring and fall. If you have never done fall planting, I urge you to give it a try. Experiment with fall crops. Talk to neighbors and friends who do fall planting. And most of all, have fun with it. If you plant your carrots or beets a little late, they might not reach full size but you will have some beautiful mini carrots and beets. And if your kale, lettuce or Swiss chard do not reach full size, just tell yourself that you were planning on growing a crop of micro-greens! Yes, it might be the first days of summer, but I am dreaming of and planning for roasted beets, stews filled with kale and collards and Rachel Ray’s cauliflower soup. Once you get hooked on fall harvests from your garden, your thoughts will turn to the cool weather of fall on the first days of summer just like me!